Humans have the remarkably ability to integrate information from multiple memories and infer indirect relationships. But how does our brain support this important function? 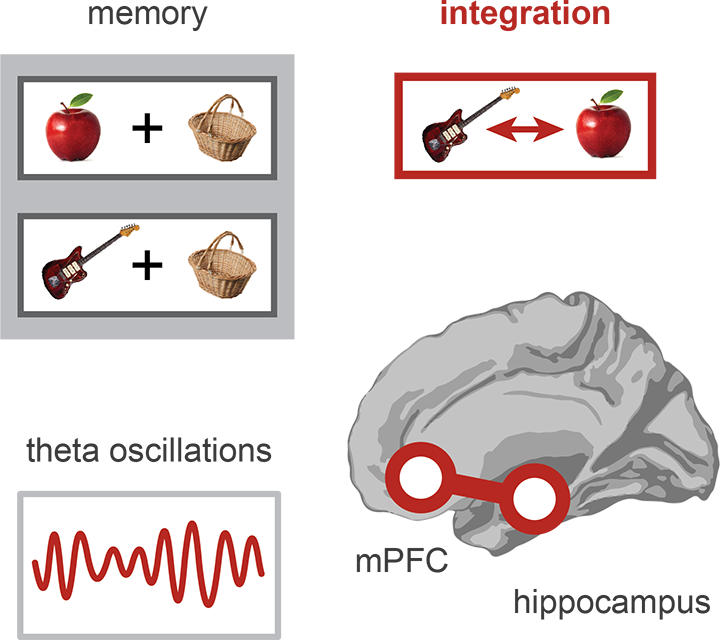 In the latest study from our lab, we show that rhythmic brain waves, called theta oscillations, engage and synchronize the brain regions that support the integration of memories. The results were published in the journal Current Biology. Activity in the brain is not constantly high or low, but rather organized in waves that come and go. For one such type of wave, called theta, activity goes up and down a couple of times per second. “We know from previous work that the theta rhythm is important for memory, and also that temporal and frontal brain regions interact when you combine memories” says Christian, senior author of the study. “Here we bring these two observations together, by showing that theta oscillations are crucial for memory integration”. 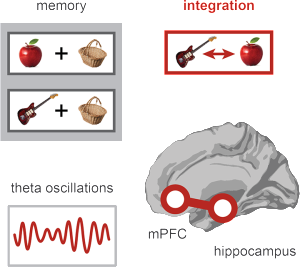 Theta oscillations from the hippocampus synchronize with the medial prefrontal cortex to link two separate memories. There was one problem: in healthy individuals, brain oscillations can only be measured from outside the brain, making it difficult to get signals from structures deep inside the brain. The hippocampus, a key brain region for memory, happens to be such a deep structure. “We had to use advanced computational techniques to reconstruct oscillatory signals from the hippocampus” says lead researcher Alexander Backus. “Using these hippocampal signals, we found that the amount of theta oscillations increased whenever someone succeeds in linking two separate memories”. In addition, we saw that theta oscillations from hippocampus were synchronized to with the medial prefrontal cortex, a brain region involved in storing knowledge networks. According to Alexander, distant brain regions are able to communicate by synchronizing their theta waves, enabling them to integrate previously stored memories. The findings are important for certain diseases linked to memory integration. For instance in post-traumatic stress disorder, memories from a past traumatic event are mistakenly linked to everyday life situations. The results of this study might bring us closer to the neurobiological mechanisms underlying such conditions. Integration of separate memories forms the basis of inferential reasoning – an essential cognitive process that enables complex behavior. Considerable evidence suggests that both hippocampus and medial prefrontal cortex (mPFC) play a crucial role in memory integration. Although previous studies indicate that theta oscillations facilitate memory processes, the electrophysiological mechanisms underlying memory integration remain elusive. To bridge this gap, we recorded magnetoencephalography data while participants performed an inference task, and employed novel source reconstruction techniques to estimate oscillatory signals from the hippocampus. We found that hippocampal theta power during encoding predicts subsequent memory integration. Moreover, we observed increased theta coherence between hippocampus and mPFC. Our results suggest that integrated memory representations arise through hippocampal theta oscillations, possibly reflecting dynamic switching between encoding and retrieval states, and facilitating communication with mPFC. These findings have important implications for our understanding of memory-based decision-making and knowledge acquisition.